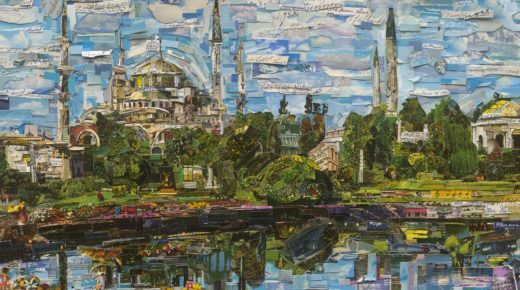 Vik Muniz incorporates the use of familiar objects harvested from various periods of pop culture and art history to create bold, ironic, and often deceiving imagery. His practice reflects two main characteristics of postmodern photography: appropriation and material based setup. Taking familiar images as reference point, the artist manipulates the way we perceive images by recreating them in unusual ways. Muniz reinterprets the images with the repetition of humorous and sometimes distressing units such as caviar, chocolate syrup, diamonds, dry pigment, dust, garbage, magazine shreds, paper hole-punches, sugar, thread, and toys. Vik Muniz (b.1961, São Paulo, Brazil) has exhibited extensively internationally, including exhibitions at International Center of Photography, New York (1998); the Whitney Museum of American Art, New York (2001); the Irish Museum of Contemporary Art, Dublin (2004); the Museum of Contemporary Art (MAC), Lima (2014); Museum of Contemporary Art, Tel-Aviv (2014); Museo de la Universidad de Tres de Febrero, Buenos Aires (2015); High Museum of Art, Atlanta (2016), and most recently, Museo de Arte Contemporanea, Monterrey (2017). His works are included in the collections of many major museums, including the Art Institute of Chicago; Guggenheim Museum, New York; Los Angeles County Museum of Art; Museo de Arte Contemporanea, Prato, Italy; Museo de Arte Moderna de Rio de Janeiro, Brazil; Museum of Modern Art, New York, and San Francisco Museum of Modern Art. In 2010, Muniz was featured in the documentary film directed by Lucy Walker; Waste Land, which is nominated for the Academy Award for Best Documentary Feature at the 83rd Academy Awards. The artist lives and works New York and Rio de Janeiro.